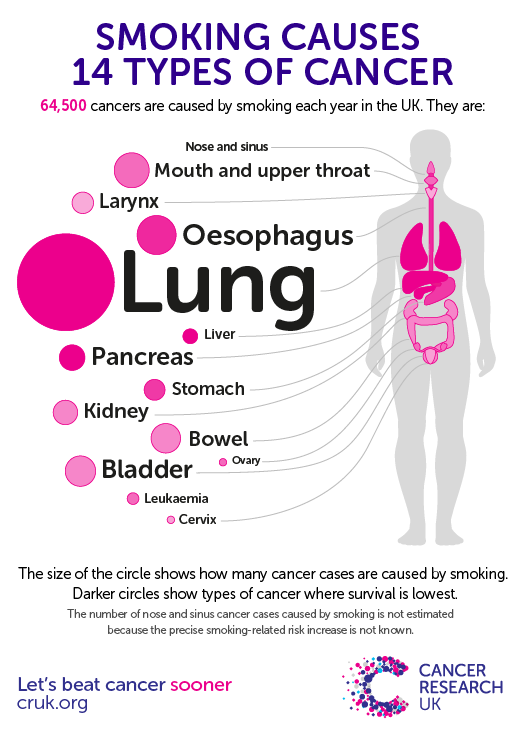 Smoking is a risk factor for developing cancer and not just lung cancer. Smoking is the single biggest lifestyle change that you can make to reduce your risk of cancer. Our research showed that 27% of people who smoked stopped after they were diagnosed with cancer. We know it is difficult to quit but it is possible to break this habit. If you have support to quit smoking your chance of success is much higher. Our research showed that two thirds of smokers wanted to quit…and now so do you. Wanting to quit is the first step needed for you to stop smoking. We can offer help and advice but you need to do this for yourself. If you stop smoking now not only will you reduce your risk of developing cancer but you will also significantly improve your overall health and longevity. For more information on how to quit click Next.